Anyone who knows me also knows that I love to dress a table beautifully and invite my friends over for a home cooked meal. Given just how cold it is outside right now, I want to create a very warm, minimal looks for this February. Lately, I’ve been eating at home a lot more. I am still doing my Keto diet, in an attempt to completely detox myself after discovering in December that I had a particularly bad bacteria, which were causing ulcers. This bad news made force me to change what I was eating completely, eliminating sugars and carbs entirely from my diet and replacing them with good fats and protein. After only a month, I have seen dramatic changes in my health and my energy! It is very disheartening to realise that most of the products out there are full of very nasty ingredients that actually makes all of us very sick! On the bright side, it is very easy to cook healthy meals – you just need to change a few bad habits. So, to celebrate life, the Keto diet, and Valentine day with friends, I am sharing with you my latest table styling, which incorporates my two new favourite brands, Blomus and Not Perfect Linen. I have been admiring Blomus’ ranges for years and I was very excited to use their products for the first time! 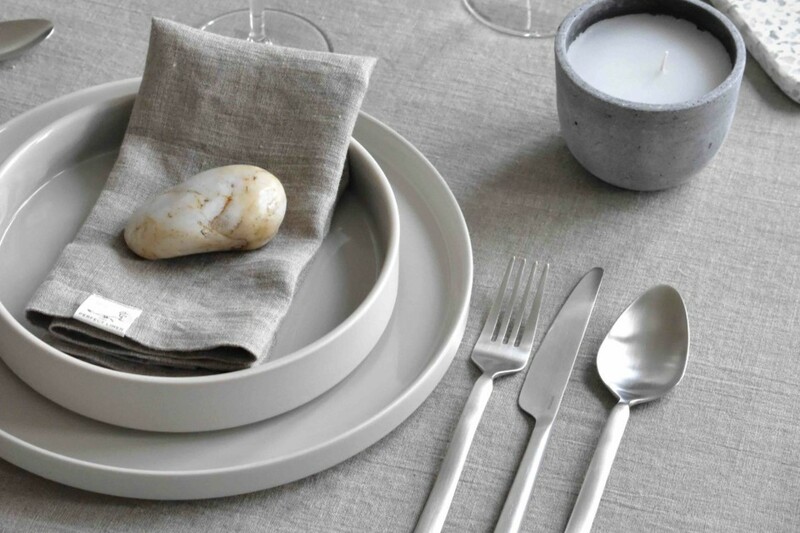 I have selected their simple, timeless ‘Mio’ collection plates in Moonbeam to create a warm and light base for the dish. 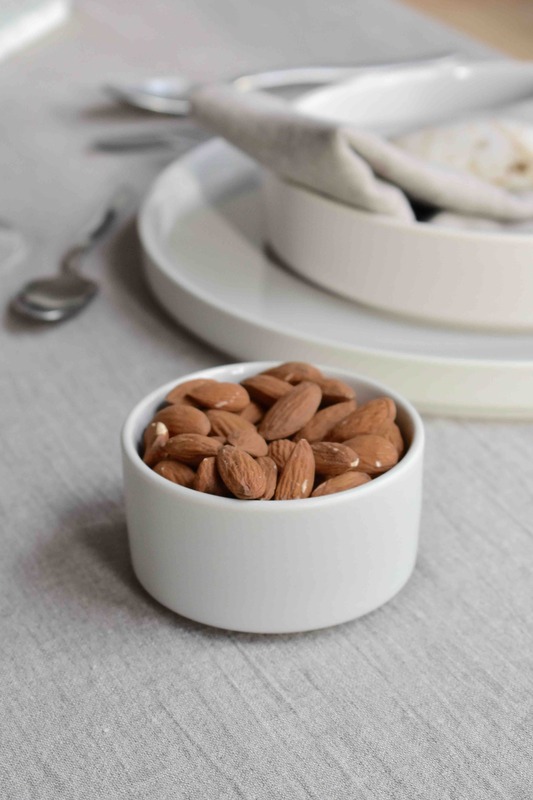 The colour Moonbeam plays as a light beige with a soft sheen and effortlessly complements the simple elegance of the plate. I layer the deep plates over the aged ones to create depth for a very functional and aesthetically pleasing table look. 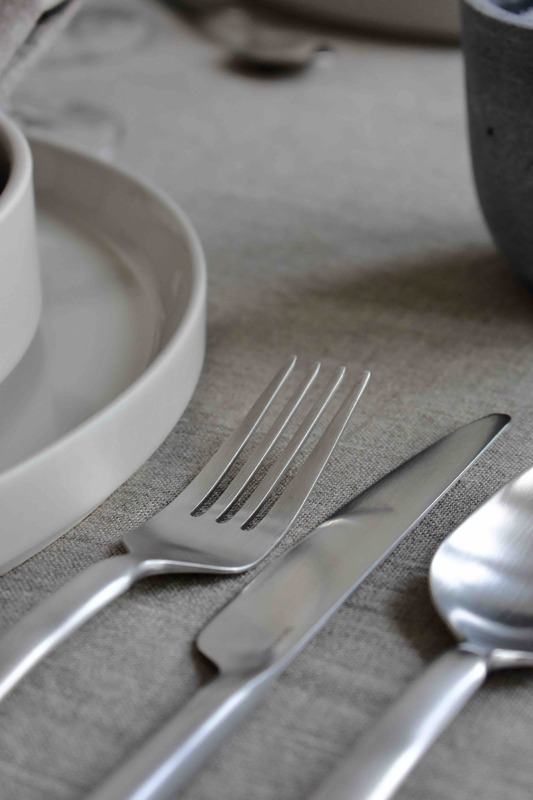 Blomus recently released the new Stella stainless-steel silver cutlery collection in matt. It comes as a 16 piece set for four people, complete with four tablespoons, teaspoons, forks and knives. 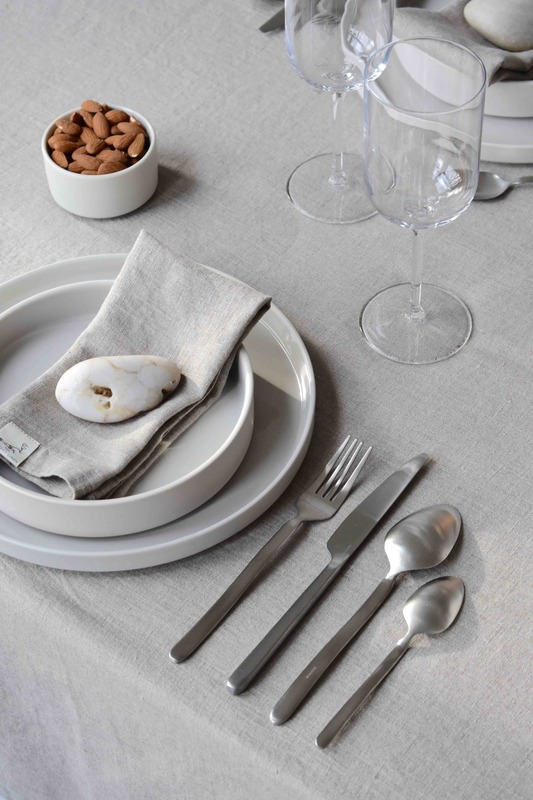 What’s great about Stella, is that whether you are using the set for an occasion or everyday use, it blends perfectly with everything else while injecting a touch of elegance and modern style to your table. I love to work with texture and add different materials. 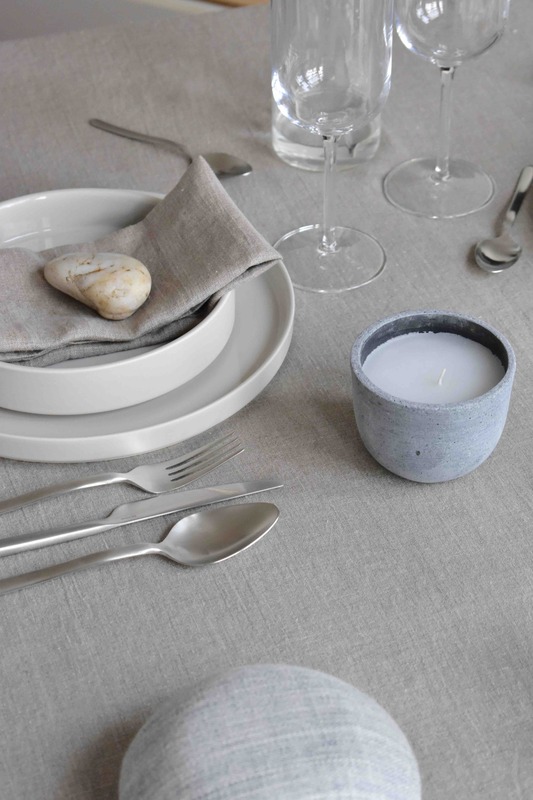 This concrete CALMA candle, made from dark grey holystone, perfectly contrasts with the beautiful natural washed linen table cloth and napkins set by Not Perfect Linen. It is a warm grain. 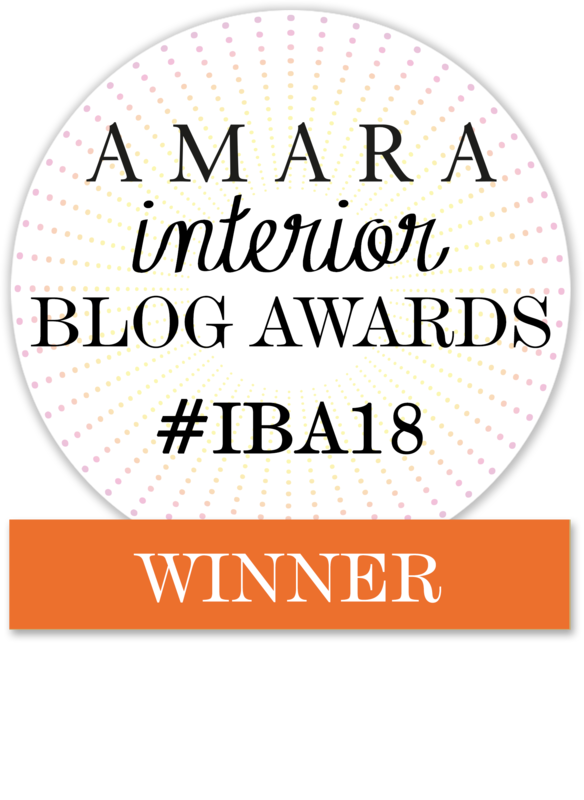 Not Perfect Linen is one of the new highlights for me this year. I really love their products and that there is such a sustainable and ethical approach behind their beautiful brand. Promoting a very transparent, refreshing look on business, Not Perfect Linen ensure quality with honestly handmade products. 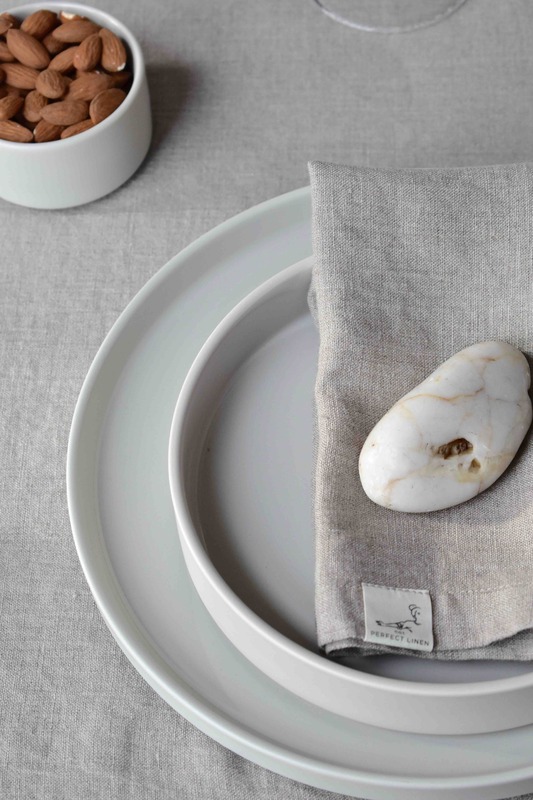 They take their time to produce each item, endorsing modern, slow living, keeping things small, human, and oh-so real. Why NOT Perfect? 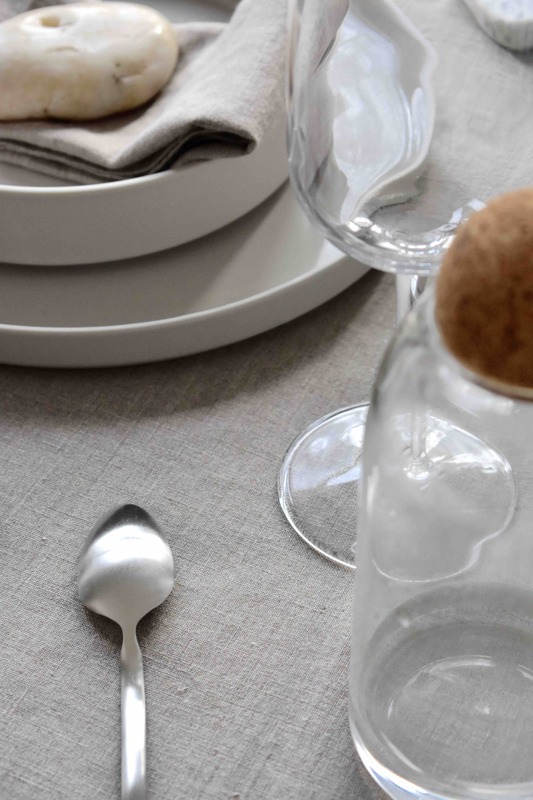 Simply, the beauty of linen is that it is not perfect. If you keep attempting to iron it, you will definitely miss the beauty of it. Linen needs to be used and it gets better with age. Linen pieces are comparable with old English leather shoes or old mechanical Swiss watches – all of these things are not new or perfect but are definitely more valuable than anything new. 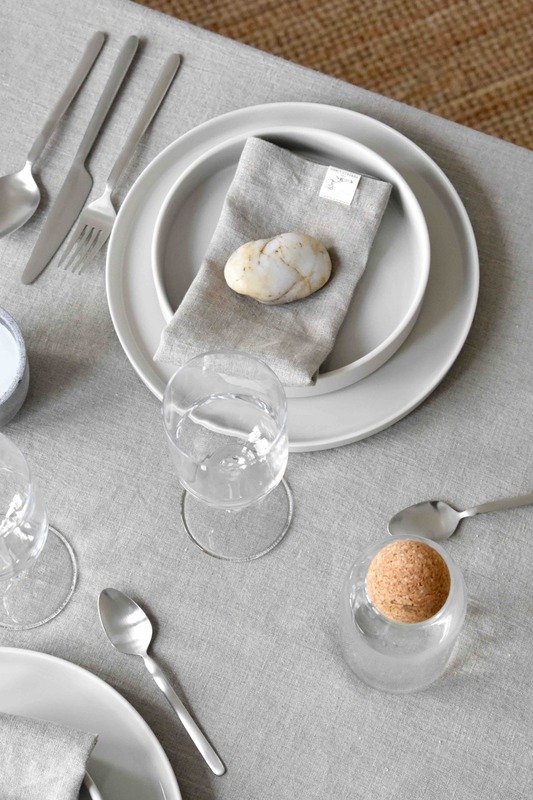 We are inspired by the simplicity and imperfection of linen, and it is a delight to share something irregular, something so perfectly imperfect, with you. 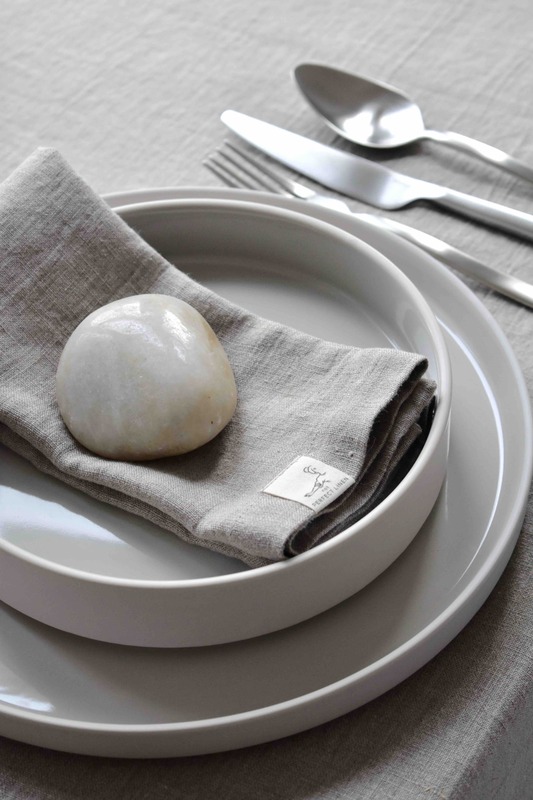 To bind these two natural brands, I used white pebbles stones as napkin holders and simplistic adornments. I stumbled upon these sea-polished stones in Brighton last year, and I adore them. I hope this post has inspired you to create a beautiful dinner and share some quality time with your loved ones!